Mercury goes retrograde in Leo 26 July-19 August 2018. Leo is fashionably late to this big party in the sky, with Mercury joining Mars retrograde and the dramatic summer eclipses. One of these eclipses happens almost on Mercury’s station (27th) and is conjunct Mars retrograde. Another happens in Leo - the last one - and it’s conjunct Mercury retrograde (11th)! Notice a theme? With eclipses and retrogrades mixing it up like this, it looks like there is tons of backtracking and reviewing on the agenda this summer. Is this relationship / job / lifestyle really what you want? You might experience a change of heart during this period or even see your dreams take entirely different turns. More than this, this Summer’s Mercury retrograde allows you to travel back in time, rescue what is worth saving and carry it forward into a brand new future. The pile up of retrogrades and eclipses is creating an energy vacuum right now, something nature abhors. Nature will surely rush in to fill the void but you have a rare chance in the meantime to go back over something, do what you need to do and say what needs to be said. It’s summertime. There is nowhere you have to be. Time to sort out unfinished business! Mercury’s station retrograde on July 26th promises to be quite tense. You’re already feeling antsy and irritable due to Mars retrograde and there is the Total Lunar Eclipse in Aquarius to contend with too. Things have gathered so much speed by this point that there is nothing you can do but sit back and enjoy the show. Once the curtain falls, you’ll have plenty of time to review the situation. July 26th-August 19th is the time to hit ‘Pause’, ‘Rewind’ and ‘Replay.’ Drop the act, stop pushing / resisting and ask yourself: what does my heart really want out of this? Leo represents world leaders and celebrities and so we might expect some backtracking from people in the public eye with Mercury retrograde in Leo. Got any popcorn anyone? Avoid elective surgery, don’t sign any papers and steer clear of major purchases. If you travel, double-check all your documents and make sure you have all your bags and items accounted for. Leave lots of time to get places. Try not to get into arguments if you can - whether with loved ones or the person behind the counter. The only exception to the ‘no agreements’ rule is when something flies right out of the past and in through your window! This you need to deal with there and then and finish what you started. Mercury has been wonky since 7 July and won’t fully return to normal until 2 September. So hold your horses till Autumn when the eclipses are over and Mars is also direct. Sudden events with unpleasant consequences can be caused at a global level: Read Mercury retrograde and historical world events. So where can you expect the past to be dredged up into the light? Where might you have a change of heart? And what do you really need to revisit and discuss, airing any grievances in the process? Let’s have a look at the horoscope for your star sign and read also how Mercury retrograde affects your love life! Dear Aries, three little words apply here: old lovers return! 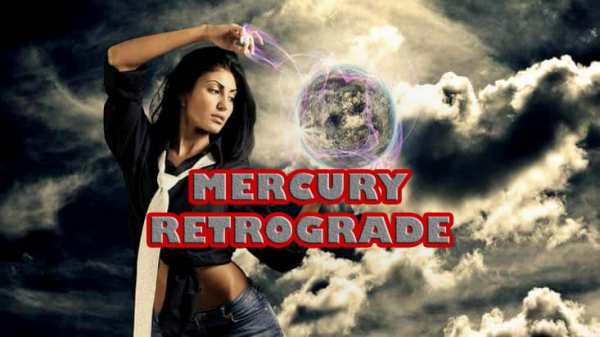 Mercury backtracks through your love zone so get ready for a blast from the past and for a second chance at love that did not quite come to full bloom before. It’s also time to rethink your attitude around matters of the heart and around taking risks in general. What do you need to do to find greater happiness in your life? What’s holding you back from finding love or from expressing yourself creatively? This is a good time to revisit an old hobby or reconnect with a child. It’s time to clear house, dear Taurus! This could a physical house clearing, where you joyfully uncover old memories and ditch what’s past its love-by-date. But it is an emotional house clearing too, where you can finally review past situations and see them in a new light. Words need to be said and conversations need to be had with a parent. It’s time for you to retreat and spend some time alone. This is also your cue to reconsider whether you’ve set up home in the right place, dig up your family tree and uncover your roots, or have some good old therapy. Communication with the outside world could go quiet during this period, dear Gemini. Your usual contacts are not available - or it might be you who’s incommunicado, immersed in a creative project or travelling somewhere off the grid. Take this opportunity to reconsider your environment and the way you handle your communications, your connections to the outside world and your day to day movements. This is a good time to go on an email detox, study, switch off your phone or sit back quietly with a good book. Money, money, money, dear Cancer! This summer has money written all over it! It might be money you’re owed, money you share or money you want to make and is late in coming. Either way, this is the time to reconsider your financial situation and, by extension, your priorities in life. Do you invest your time and energy in the right people and projects? Are you happy with the way - and amount - you earn? Do your relationships reflect your values? If not, time for some backtracking. Old money arguments could resurface now. You might finally receive that check. Mercury retrograde in your sign urges you to re-examine your whole outlook on life, dear Leo! You’re ready to put your attitude, personality and goals under the microscope and that’s a tall order! It’s time to tidy up loose ends and put the past behind you. This will allow you to make a brand new start when the eclipse arrives in your sign mid-August. How do you feel about going incognito for a while? Turning off your phone? Or maybe there is something you need to get off your chest? Forget the audience for a minute, ignore the applause and give yourself the gift of time alone with your thoughts. The first few weeks of August are prime time for a spiritual retreat, dear Virgo! You need to reconnect with your source and draw some spiritual and creative strength. Do you feel that the universe has your back? Give the cosmos a chance to show you how loved you are! Tap into your inspiration! This is the best possible time to go into therapy, tackle your inner demons and shed light on the past once and for all. You could also find this a highly creative time. A secret or insight could fall into your lap providing the key to the puzzle and helping you find closure. Old pals reunite! That should be the slogan for this summer’s Mercury retrograde, dear Libra, as it happens in your friend-zone. You are in for a blast from the past that could bring you joy and even closure. If things have been left unsaid with a friend it’s time to say them. Have it out! Nothing can move forward unless you reconnect and revisit past hopes and dreams that tie you to that particular group of people. Only then will you know if the dream is worth saving or if it’s time to dream fresh dreams… So make the first move and have a ball! You have some major thinking to do, dear Scorpio. Where are you headed in life? Where is your career going? If you’re not happy with the way things are you still have time to backtrack to a point where you felt happier. A lot has happened much too fast, so take a moment to consider whether this is really what you want. What are you aiming for in life? Getting clear about where you’re going right now will help you proceed with a much surer step come the Autumn. An old boss might get in touch offering you a second chance at something. Feeling like rolling up your passport and going barefoot into the wild, dear Sagittarius? You want to unwind, forget civilisation and take a long overdue trip. Delays are possible but if it’s been on your mind then do it! Publicity houses, courts, media towers, universities - they’re all practically shut and don’t need your input right now. You can let your mind wander and rethink your life’s bigger picture. Travelling will be memorable now, even if cumbersome at times, helping you get closure on a place or person that meant a lot to you. Time to revisit that difficult place that has to do with money shared, dear Capricorn. Who owns what? Who owes what to whom? And whom can you trust with your love, your money, your investment? An old debt is up for review and, given the timing, you can really write this one off once and for all if you play your cards right! On a more personal level, intimate relationships are also up for review. What old ties and dependencies do you have that prevent you from moving forward with someone? An overdue cheque might finally arrive. It’s time to review an important relationship, dear Aquarius. This could be a love relationship or a business partnership that you feel has gone too long without some important things being said. Take time to rewind and go over old ground, clearing the air and getting things off your chest. Others might be unreliable during this period. Or they might simply be out of reach. No matter. This will give you time to rethink whether you’re happy with said partnership or agreement. Old associates - friend or foe - knock on your door.